Learn how the wolves were reintroduced; trapped, transported, and finally released in Yellowstone. 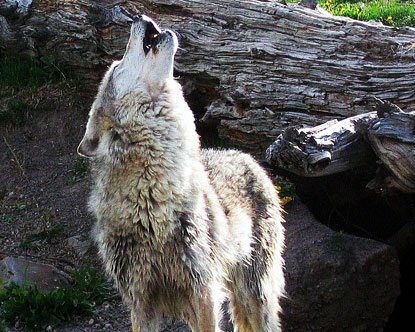 For the first time in nearly 70 years the howl of the wolf is being echoed throughout Yellowstone National Park. Canis Lupus, the Gray Wolf, one of the largest and most complex of the canine species, has been successfully reintroduced into the Yellowstone ecosystem. In mid-January 1995, 14 wolves from many separate packs were captured in Canada and then transported into Yellowstone Park and placed into one-acre acclimation pens. The reasons for not capturing an entire pack, or packs and moving them into Yellowstone is primarily because it is very difficult if not impossible. When a pack hears a helicopter approaching they generally run for cover—the timber. Biologists were lucky to capture one or two individual wolves out of each pack. Capturing individuals out of different packs also cut down on the chances of inbreeding later on and increased our DNA pool right from the start. Had we captured three entire packs the first year the chances of inbreeding would have greatly increased. Biologists then placed a dominant male wolf with a dominant female wolf along with several young subordinate wolves into each 1 acre acclimation pen, and within about 24 hours or so the wolves in each of three pens had the entire pack structure figured out, and in each case but one, the newly formed alphas mated and gave birth. The one case were this did not happen was during the second years release (winter 1996-97). When the Nez Perce pack was released. The male wolves went one direction and the female wolves went another. The three pens were constructed the previous summer at three different locations in the Northern range of Yellowstone; one at Crystal Creek, one at Rose Creek, and the third at Soda Butte creek. The soft release method was used in Yellowstone Park, versus the hard release method which was used in Idaho. 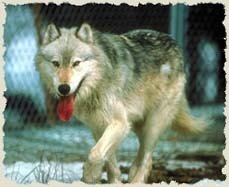 While in their acclimation pens the wolves were fed road kill or winter carrion. Each pack was fed once each week to week and one-half. Wolves in the wild survive on a “feast and famine” type diet and do not eat everyday. We have recorded wolves going 14 days without a meal with no ill effects. A typical pack of six in the wild will consume on average 800 pounds of meat per month. In Yellowstone that would average out to two adult elk and maybe a small deer. When wolves do make a kill, each wolf will consume on average of 21 to 32 pounds of meat. Meat drunk, the wolves then stagger off a short distance and lay down to digest that massive amount of meat protein. The pack then returns to the kill off an on until the carcass has been cleaned. The packs released during the winter of 1995-96 fed primarily on elk, although biologists believed the three packs would learn to take bison in the future. Two of the four packs released during the second release period, 1996-97 were observed feeding on bison prior to being trapped in British Columbia. Biologists had hoped that they would begin preying on this overabundant mammal soon after release, although this was initially not the case. The first bison kill was recorded during the late winter of 1996-97 by two surviving members of the Crystal Creek pack after they moved south into the Pelican Valley after #5M, the alpha male was killed by the Druid Peak pack up near their release site. Today, 90% of all wolf kills are elk, the other 10% consist of bison, deer, moose, and other small game. In late March of 1995, the three packs known now as the Crystal Creek pack (6 members), Rose Creek pack (3), and the Soda Butte pack (4), were released out of their enclosures and into the wilds of Yellowstone Park, but not without a minor problem. The wolves were associating the gate with human’s and avoiding the gate area. The wolves learned that when humans arrived, they entered through the gate, and considered the gate area as “human territory”. A section of the “comfort zone” area fence was then cut with bolt cutters, rolled up and removed. The wolves then exited their acclimation pens through this new opening. After release the three members of the Rose Creek pack and then the six members of the Crystal Creek pack each made their way northeast out of Yellowstone Park to an area near Red Lodge, MT. The four members of the Soda Butte pack headed out into the Absaroka-Beartooth Wilderness not far from their release site northeast of Yellowstone. The Crystal Creek pack then turned around and followed the same route back to their release site – 50 air miles, 100 round trip! – where they were then observed by thousands of visitors up until July. On April 26, 1995 the radio collar on the alpha male #10M with the Rose Creek pack triggered a mortality signal. It was subsequently proven in court to have been killed illegally by Chad McKittrick of Red Lodge, MT. With the alpha male’s death the pack structure fell apart and the remaining two members: one adult female, #9F and one yearling female, split. We have learned that it is extremely stressful on a wolf pack when one or both of the alpha’s die or are killed and the survivors generally disperse. Some as loners, some travel together in sibling pairs or groups. On May 3, 1995, just days after her mate was killed, the alpha female, #9F gave birth to eight puppies on private land near Red Lodge, MT. Under normal conditions all members within a pack assist the alpha female in caring for the pups until they have been weaned at about 6-10 weeks of age. U.S.F.W.S. biologists began supplying her with food until it was decided to transport her and her 8 pups back to the Rose Creek acclimation pen, where they were kept until October and then re-released. The primary reason for capturing #9 and her 8 pups after #10’s death was at the time #9 and her 8 pups constituted 48% of the total wolf population in Yellowstone park! It was critical that they survive. Today, we allow nature to take its course and no help is provided to injured wolves or packs. Prior to this second October release of #9F and her pups a young 2 year old male #8M dispersed from the nearby Crystal Creek pack and began hanging around the acclimation pen falling in love with #9. In mid- August high winds knocked a tree down which opened a small gap in the acclimation pen just large enough for pups to escape. It was feared that coyotes would prey on these vulnerable pups but #8M took over and ran the coyotes off protecting them from danger. Upon release #9F accepted #8M as her new mate, and alpha male. The Soda Butte pack was the only other pack to give birth with one new addition the first year. Spring melted into summer with no other deaths or unexpected surprises except for the visibility factor. Wolves were visible from the road up until the first of July which went against all predictions. In the wild, wolves are rarely seen. Dr. David Mech visited Yellowstone the spring of 1999 and reported he observed more wolves during his 7 day stay in Yellowstone than during his entire 35 years of research and study of wolves. Yellowstone Park officials reported 22% more visitors during the month of June alone. Many of the sightings made during the summer of 1995 were false sightings due to a misidentification of coyotes (Canis latrans). This continues today. Many visitors jump from their cars and chase after coyotes thinking they are photographing wolves. No. 9 and her 8 pups; the Rose Creek pack were re-released in October. One of the pups then gets killed by a UPS truck in the park. No. 8M learns how to be an alpha male. The yearling female that took off on her own after her father, #10M was killed now mates up with a second young male dispersal from the Crystal Creek pack and forms the first natural pack in Yellowstone Park: the Leopold pack. Genetics 101, anybody? Two more acclimation pens were built for the second release period of 1996-97: one at Nez Perce Creek, and a second on Blacktail Plateau bringing the total enclosures available to four. During the winter of 1996-97 the Yellowstone reintroduction program ended after releasing 17 more wolves out of the 4 separate acclimation pens. The reintroduced wolves have continued to mate and produce new litters of puppies and 2 year olds dispersing and establishing new packs in newly formed territories where wolves have not been seen in many years. The idea of reintroducing wolves back into Yellowstone Park started many years ago. I personally had not thought much about it one way or the other until one August morning back in 1992, three years before the reintroduction. I was with a film crew from Busch Productions busy filming grizzlies on a bison carcass when a lone wolf appeared out of the early morning mist. The hair on the back of my neck stands up even today when I think of it. Here we are miles from the road, nine or more grizzlies coming in to feed along with about 200 ravens, bison, coyotes, elk and this one lone black wolf. I remember whispering to Ray Paunovich every couple of minutes, “I hope you’re getting this”, and wondering at the same time if this was really happening, or was I dreaming? I’ve witnessed many unusual or interesting sights in Yellowstone. Anyone that spends 250 days a year traveling the backcountry of Yellowstone is apt to have some exciting experiences but this will always be a morning I will never forget. A typical wolf pack is a highly structured, highly complex social group. The average pack in the wild consists of six-eight members. The pack size is dependent on several factors: the amount of prey available within the pack’s territory, and the wolf density or the amount of wolves in the area. If the prey base is low and the wolf density is high a female may not cycle and give birth. If the opposite is found a female may give birth to many pups. A typical pack consists of an alpha male, an alpha female – and their offspring. Generally the alpha pair are the only two that breed and the only two in a pack who are genetically different or were born from different packs and unrelated. The remainder of the pack consists of the alpha’s offspring. However, in certain instances we have observed brothers and sisters and fathers and daughters mating although this is rare and is caused by the non-availablity of any other potential mates over a long period of time–the need to reproduce is so great that if no other partner is available for a long period of time individuals may mate with siblings or parents. A small percentage of packs will sometimes have Beta males who will also breed with the alpha female. Beta males generally occur when two brothers disperse from the same home pack as two or three year olds and travel in search of a female and a female accepts both males. The same is true with Beta females. Yearling females or sub-adults may go through a false cycle when the alpha female becomes pregnant and may become a wet nurse to her new siblings. Packs typically dig dens with the alpha female giving birth in mid- April or early May. The entire pack is involved in the raising of the pups. Prolactin is present in each adult member of the pack when puppies are born, male and female. In humans prolactin is only present in females. As two-year-olds, some or none may disperse from the pack possibly forming new packs of their own, or may return to their original pack at any time (as long as the original pack occupies the same territory), or in certain instances travel as loners. Some will stay with their original packs for life and just be part of the pack. Those that choose to not leave or disperse will typically not give birth or raise young of their own. Packs are very territorial and will even fight to the death to protect their territory. The removal or death of the alpha male or female sometimes destroys the pack structure with the remaining members “often” dispersing. We have seen the surviving alpha’s traveling with several offspring and often siblings will travel in groups as well. We have even observed all surviving pack members sticking together with the surviving alpha locating a new mate. Just about anything is possible. The soft release method of wolf reintroduction involves simply placing wolves that have been trapped from one location into a one-acre fenced enclosure for a period of months to acclimate them to their new environment. This “soft release” method was developed some years ago by the U.S.F.S., and then used by Mike Phillips in North Carolina to successfully release Carolina red wolves into the wild. Mr. Phillips was then brought into Yellowstone to duplicate this release method as part of the Yellowstone Wolf Recovery Team. The 1 acre acclimation pens were constructed of heavy gauge wire fence material 10 feet tall, round or oblong in shape with a two-foot wide inverted top. The shape was used to prevent any of the wolves from climbing out over the top of the enclosure. We found that wolves held in square cornered enclosures have the potential to gain momentum while circling the enclosure to reach the top. Wolves are also able to jump so high, that they often are able to jump and grab the chain link fence with their teeth and then pull themselves over. Inverting the top acted as a secondary backup. A four foot chain link ground apron was also added in case the wolves attempted to dig their way out. Using this type of release is much more successful. By allowing the wolves to first become acclimated to their new surroundings the potential for them to take off and head home is greatly decreased. The key here is to keep the stress level, and the amount of human contact down to a minimum prior to the actual release. Keeping wolves in an acclimation pen is also advantageous in that researchers can choose the best time to release the wolves, and what better time to do so than when the wolves “safeway store on four legs”; elk are walking by the acclimation pen! Using the “hard release” method is less successful. The wolves have a greater potential for getting into trouble and running for home. This type of release involves: trapping wolves from one area, transporting them to a new area in individual containers and then “kicking them out” into a new area without acclimating them to that area. This type of release was used in Idaho. A combination of the two types of releases can be incorporated successfully. Two of the four releases in 1996-97 involved using both of these methods together. Why is the Hard Release method less successful? Wolves and wolf packs are very territorial and will kill or fight any wolves who have “invaded” their territory. When we captured wolves in Canada and transported them into Yellowstone and Idaho the wolves did not know that there had not been wolves in the release area for over 70 years. Plus, most of the wolves had never seen each other before being released. Hence, the wolves released into Idaho were under an extreme amount of stress and were in fear of their lives. The wolves kept in the acclimation pens inside Yellowstone Park howled. They howled during the day and at night and during the 10 weeks they were kept in the acclimation pens not once did they hear a response. Wolves cannot resist a wolf howl and will automatically respond if they hear a howl, so that by the end of the 10 week period the newly released wolves were calm and did not fear being killed by other wolves. The wolves released into Idaho scattered in most cases. If you are visiting Yellowstone National Park during spring or winter the chances of seeing a wolf are actually quite good, given the right location and time of year. Chances of seeing a coyote are much greater. For some, it can be difficult to distinguish between coyotes and wolves. Until you have actually seen a real wild wolf, in which case you will never mistake the two again. In general wolves are much larger than coyotes. The legs of a wolf appear much longer in proportion to its body; the legs and muzzle of a coyote are particularly delicate in appearance. Coyotes are rarely pure black or white in color. I have never seen one. Instead, they are often light to dark gray with rust or brown. From 1995 to present, every pack of wolves that I viewed had at least one black member. That’s not to say that you might not encounter a single gray individual, or an entire pack of gray wolves. As time goes on we see more and more gray or light colored wolves in Yellowstone. Wolves are larger than your average german shepard and massive in appearance. Note size of #194M’s head in relation to Deb Guernsey’s body in photo. “The Wolf,” The Ecology and Behavior of an Endangered Species, by Dr. L. David Mech. Published by University of Minnesota Press. “The Return of the Wolf,” by Steve Grooms. Published by North Word Press. “Return of a Predator: Wolf recovery in Montana,” by Ed Bangs. Published by Western Highlands. “Looking At the Wolf”, by Bruce Thompson. A publication of Teton Science School. “The Way of the Wolf”, by Dr. David Mech.. Voyageur Press. We thank our friends at https://usacasinocodes.com for supporting the Yellowstone-Bearman website! Wolf packs do not have a rigid hierarchy in the wild, they are instead families- what were previously considered the "alpha pair" are actually the breeding pair, and the rest of the pack consists of their offspring. Dr. L. David Mech, who originally popularized the alpha theory, has renounced it due to having recorded the initial research in captive wolves.